The school owes its name to Miss Ewart, a generous Irish woman UN agency was faculty initial patron and provided the initial funds needed for the got wind of of the school. the varsity that started with some of pupils and a loyal band of lecturers currently has nearly 3000 pupils educated with a similar zeal by intimate members of employees. 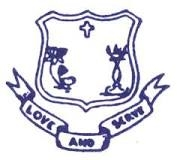 the varsity was recognised as a admission faculty in 1943 and upgraded as a better Gymnasium in 1978. Procedure: Admission are open for class PreKG from Oct 5, 2018 for the academic year 2019-20. Higher Class Procedure: If there is vacancy, then the school might issue application forms. Contact the school directly. Admission are open for class PreKG from Oct 5, 2018 for the academic year 2019-20. School will start issuing the application forms from 1st December, 2017 onwards for the academic year 2018-19. Parents reported receiving Interview Call Letter. All the Best. School has started issuing the application forms on Nov 28, 2016 onwards for the academic year 2017-18. Reach the school soon. Application forms will be issued in the month of Jan, 2017 for the next academic year 2017-18. School will be issuing the Application form from 4th Jan 2016.